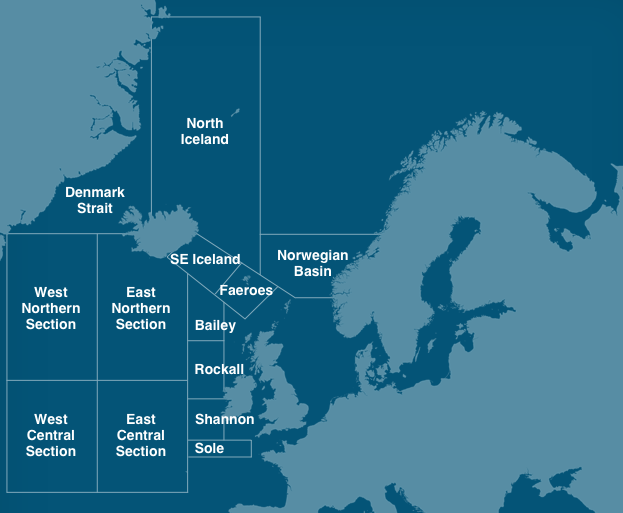 Mapping images supplied by the Maritime and Coastguard Agency (MCA). Issued 25 April 19:00 UTC by the Met Office on behalf of the Maritime and Coastguard Agency (MCA). Southwest, veering northwest for a time, 6 to gale 8, occasionally severe gale 9 later. Rough at first in east, otherwise very rough or high. At 251200UTC, low 50 north 36 west 999 expected 53 north 15 west 984 by 261200UTC. Winds will reach storm force 10 between 30 and 150 miles of the centre in the southwest semi-circle between 260000UTC and 261500UTC, and between 30 and 150 miles of the centre in the southwest quadrant after 261500UTC. Winds will also reach violent storm force 11 between 50 and 100 miles of the centre in the southwest quadrant between 260300UTC and 262000UTC. West or northwest 7 to severe gale 9 decreasing 5 or 6, becoming cyclonic severe gale 9 to violent storm 11 later. Rough at first in east, otherwise very rough or high, becoming very high later in southwest. Cyclonic 6 to gale 8, occasionally 5 at first, perhaps severe gale 9 later. Rough or very rough, becoming very rough or high for a time at first in south. East or southeast becoming cyclonic, 4 or 5, increasing 6 at times. Moderate or rough, occasionally very rough. Easterly or southeasterly 5 to 7. Rain or showers, fog patches. Northeasterly 6 to gale 8 at first in west, otherwise easterly or southeasterly 5 to 7. Moderate or rough, becoming rough or very rough later. Westerly or northwesterly, mainly 4 or 5 in west, but otherwise 5 to 7, occasionally gale 8 in south, perhaps severe gale 9 later in far southeast. High at first in far southeast, otherwise rough or very rough, becoming moderate or rough later in north. Cyclonic 5 to 7, occasionally gale 8 in south and in far north and northwest, decreasing 4 at times elsewhere. Rough or very rough, occasionally moderate in north. Rain or snow in far north, otherwise sleet or snow showers. Moderate or good, becoming poor at times, but occasionally very poor in far north. Northwesterly 5 to 7 at first in east, otherwise westerly or southwesterly 6 to gale 8, occasionally severe gale 9 in north, then veering westerly or northwesterly 4 or 5 later. Very rough or high, occasionally rough in west. Moderate or poor, occasionally good. Westerly or northwesterly 6 or 7, decreasing 4 or 5 later. Moderate or good, occasionally poor at first. Northerly or northeasterly 6 to gale 8, increasing severe gale 9 at times. Fair at first in east, otherwise rain, snow or drizzle. Moderate or poor, becoming very poor at times, but occasionally good at first first in east. Easterly or northeasterly, mainly 4 or 5, but 5 to 7 in far south and in far west. Moderate, occasionally rough in far south and in far west. Rain, drizzle or showers in south, fog banks. Easterly or southeasterly 4 or 5, increasing 6 or 7 for a time in west and southwest, becoming variable 3 at times in central and eastern areas. Moderate or rough in west, slight or moderate in east. Fair in east, but rain, showers and fog patches in central and western areas. Moderate or good, occasionally very poor in central and western areas.